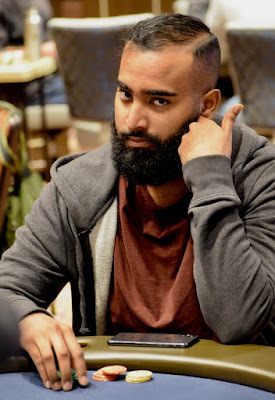 Here are the players cashing in 41-48th place in the March 2018 $1.408 Million prize pool @WPT Rolling Thunder $3,500 Main Event, including last year's Event 1 WPT Rolling Thunder champ Ajay Gnanambanthan. There's a redraw to six 6-max tables when down to 36 players - and that is taking place right now. Play continues today until down to the LiveStream final table of 6 players. Final Table action kicks off Tuesday at noon in the poker room, limited audience seating available.